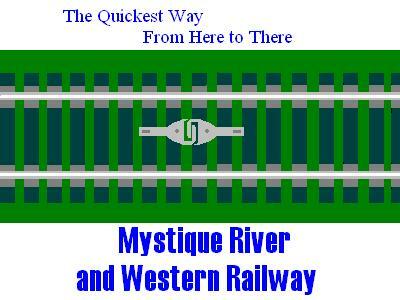 The Mystique River and Western Railway is a purely fictional railroad. It owns no motive power, but rather chooses to lease equipment. Therefore, it is possible to have multiple unit power lash-ups from the Lehigh Valley, Florida East Coast and the Atchison, Topeka, and the Santa Fe Railroads even though these prototype railroads never physically touched each other. My world of Model railroading is Pure Imagination. And, I wouldn't have it any other way. Depot Street was the first location on the railroad to be nearly completed. It is lined with a variety of small shops, a car dealership a restaurant and finally the Main Railway Terminal. The Main Locomotive facility the "Lafayette Locomotive Shop" was the second portion of the layout to achieve a level of "completeness". Numerous outbuilding and outdoor lighting add to the scene. Many Locomotives that are currently awaiting repair or locomotives that are not currently being used are sitting there awaiting assignments. As the railroad progresses you will see scenes from "Village East, Village West, and the final attraction will be the TOFC/COFC (trailer on flat car/Container on flat car). This means there is still a vast amount of work to be done. Residences and commercial buildings needed to be placed on the layout in such a way in order to make sense as to what they are and why they are there. So how far along am I? While the track work for the "Village" (East and West) is completed (but, that can change at any time), only a portion of one street has been planned out and only a few buildings may remain in their current positions. My thinking is that the full trackwork is about 75 percent complete. There is no track work for the TOFC/COFC facility. Currently, my tools sit there. In an effort to make sure my track work is "solid", I run the "finickiest" locomotives and cars to find my bad track work. After that, it's time for ballasting. If you would like to see large, well running; well maintained model railroad with some really cool, high quality scenic areas and operations, just take a side trip to the Southbound Model Railroaders and see what's there. Copyright © 2011-2012 Mike Whalen Model Railroad All Rights Reserved.